Here are some of my favourite books for writers. Each link brings you to your local Amazon for more information on each. I will get a few cents of commission if you buy through those links, to help with the running costs of the site. This is one of my favourite books. It's aimed at screenwriters rather than novelists, but we're all story-tellers and therefore most of the information is relevant. Writers are in the business of delivering an emotional experience to readers, and this book gives excellent information on how exactly to do that. It's not a book for beginners, I think, but for anyone with any experience I would absolutely recommend it for improving your writing. Another classic, must-read, book. It's part memoir (and is fascinating as that) and part a master-class in writing techniques. Stephen King knows about writing, and he shares so much good information with us here. This book is an excellent breakdown of the six core competencies story-tellers need: concept, character, theme, story structure, writing voice, and scene execution. The book is a bit waffly to be honest, and repetitious in places, but the content is definitely good enough to plough through that in order to harvest the gems. This seminal book based on Joseph Campbell's Hero's Journey. It shows the 12 steps that all hero's (of either gender, and any genre) must take. Vogler also shares excellent character archetypes too. This book is a must-have for any serious writer. There are many outlining books, and I think I must own them all, but this one is my favourite and so it's the one I recommend here. I love the fact the method she offers works for both outliners and so called pansters (those who prefer to just sit down and write, sometimes also called discovery writers). The classic book giving a step-by-step list of the various issues to look out for when editing your novel, and how to fix them. This is a lovely book from an extremely creative and artistic woman. 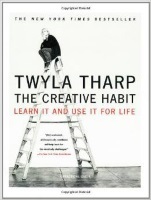 Twyla Tharp is a renowned dancer and choreographer, and in this book she shares her suggestions and experience on how to improve creativity. This is my own book about using the power of EFT (Emotional Freedom Technique, also known as Tapping) to access your creativity. It's about identifying and literally erasing all the doubts and fears that come between you and your writing. I love the play on words of the traditional 'art of war'. But this book is far more than that - it's about dealing with our inner critic who stops us, or tries to, from achieving our goals. Highly recommended. This classic book - written in 1934 - remains a must-read for anyone who wishes to be a writer. It's fairly uncompromising, challenging you to prove you really are a writer, or just a dreamer. If you're serious about this path, this is an excellent book for you.